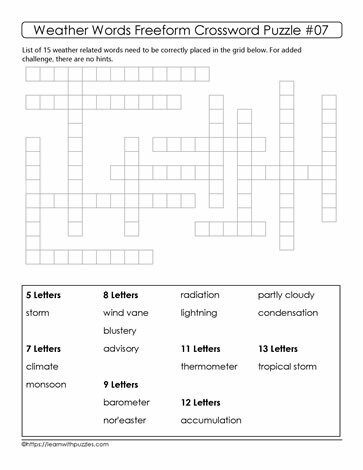 Here is a theme based freeform crossword puzzle about weather. Use the puzzle to also support learning and education related to global warming and climate change. Since the vocabulary can be used with all three topics (climate change, weather, global warming), it supports learning across multiple areas. To solve to the puzzle, start by filling in the blanks with the word/s that have the least number or most number of words. Next, find words that have letters that are shared, and fill in the blanks associated with that word. Then, continue until the puzzle is complete.